Article sourced from Fall/Winter 2016 Issue of ORE - the Official Publication of the Saskatchewan Mining Association. While the race is on above ground to develop mass market electric vehicles by automotive and IT giants including Toyota, Ford, Tesla, and Google, a Saskatoon-based company, Prairie Machine & Parts is leading the race underground. The use of electric vehicles in underground mines is a growing trend, and Saskatchewan mining companies are among the early adopters. Many factors are driving the move from diesel to electric, but it all comes down to emissions or, more accurately, the lack thereof. Electric vehicles produce zero emissions. “Air quality is definitely the number one factor behind the growing use of electric vehicles in underground mining operations. PotashCorp, Mosaic and Agrium all currently use our electric vehicles at their mine sites,” said Kipp Sakundiak, general manager of PMP. PMP is a Saskatchewan-based, internationally recognized manufacturer of heavy industrial machinery and machine components that’s been serving the mineral mining, steel production and oil and gas industries for over 35 years. In 2015, PMP acquired PapaBravo Innovations, a leading designer and manufacturer of electric vehicles and electric drive systems. PMP’s PapaBravo Electric Vehicles are designed specifically for rugged underground potash mining conditions, with robust automotive grade chassis and parts, reliable, low maintenance operation and minimal downtime. They also have great names. PapaBravo’s first machines were, appropriately for the mining industry, named for burrowing mammals – including the marmot and badger. Indeed, the prototype was the Gofer. 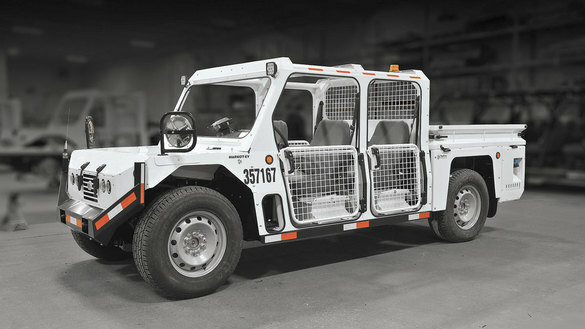 The full line of vehicles includes two to 12-passenger transports, 4×4 electric trucks and 4×4 electric vehicles. Vehicles and trucks can travel from 100 to 120 km on a single charge unloaded and from 65 to 90 km carrying a payload. Hauling capacity ranges from 3,500 lbs for personnel carriers, to 4,000 lbs for the 4x4s, to 7,200 lbs for heavy duty trucks. Depending on the charging option, vehicles can recharge to 65 per cent in an hour and fully recharge in two hours. “The units being provided by PMP are just as capable as many of the diesel machines we’ve been using in mining for years without the downside that comes with burning diesel. It’s been very beneficial to have a progressive Saskatchewan-based partner who understands the unique needs in a potash mine,” said Matt Johnson, Mine Manager, Esterhazy K1 facility with The Mosaic Company. It takes eight to 10 weeks for PMP to build a custom electric vehicle. Standard features include 4-wheel drive, soft riding coil-over suspension, patented modular drive system, certified roll over protection and lithium iron phosphate (LiFePo) batteries. Optional features include fall protection, LED lighting, back-up cameras, spring applied hydraulic released brakes and vehicle diagnostic tools. There’s also growing industry interest in the software capabilities of electric vehicles, whether it’s being able to collect detailed, day-to-day data on vehicle use for use in asset management plans, or being able to control how fast a new employee drives a vehicle and which areas specific vehicles are allowed to access. Zero emissions, quiet ride, rugged construction, reduced maintenance and operation costs, flexible configurations — there are good reasons Saskatchewan mining companies are going electric.